This will be quite a difficult review to write, not because The Sleep Room is a difficult book (it isn't; it's an easy-peasy piece of quick-reading genre fiction that I picked up in Waterstone's because I wanted something to read while I had lunch in their cafe) but simply because I didn't really have any strong feelings about it whatsoever. I don't feel as if I wasted my time reading it, but equally I don't think I really got a great deal out of it either. The premise of The Sleep Room is that of 1950s doctor taking up a residential post at a psychiatric hospital under the supervision of Hugh Maitland, a famous psychiatrist well known for his media presence and for his dismissal of 'couch merchants' and psychoanalytical techniques in favour of purely physical treatments such as antidepressants, sedation and ECT. His latest project is the experimental treatment of six disturbed women by, essentially, keeping them permanently asleep, except for short periods when they're woken for feeding, washing and the unpleasant-sounding 'voiding'. If you think this treatment sounds slightly creepy, it is, and so is the hospital in general, with its isolated location and strange secrets. It's not long before Richardson, the narrator, finds himself spooked by odd noises, the peculiar agitation and unease of the patients and nurses alike, and by his observation that all the sleep room patients mysteriously enter the 'dreaming' stage of sleep at the same time each day. And to be honest, that's really pretty much it. The horror elements are fairly low-key, except for one entertainingly gruesome showpiece with a self-harming patient, and there is a twist which should be gobsmacking but which I just found anticlimactic. It's not that The Sleep Room is bad - it really isn't. FR Tallis' prose is clear, precise and matter-of-fact in a way that befits the scientifically-minded narrator very well and contrasts nicely with the peculiarity of the events he experiences; the book's post-war setting is one I always enjoy, works perfectly for this story and is convincingly realised by the author; the feeling of isolation experienced by Richardson is suitably claustrophobic. But overall, The Sleep Room struck me as a book that is less than the sum of its parts. None of the characters are particularly memorable, and there is something lacking when it comes to the building of atmosphere, something that should be essential in supernatural fiction. 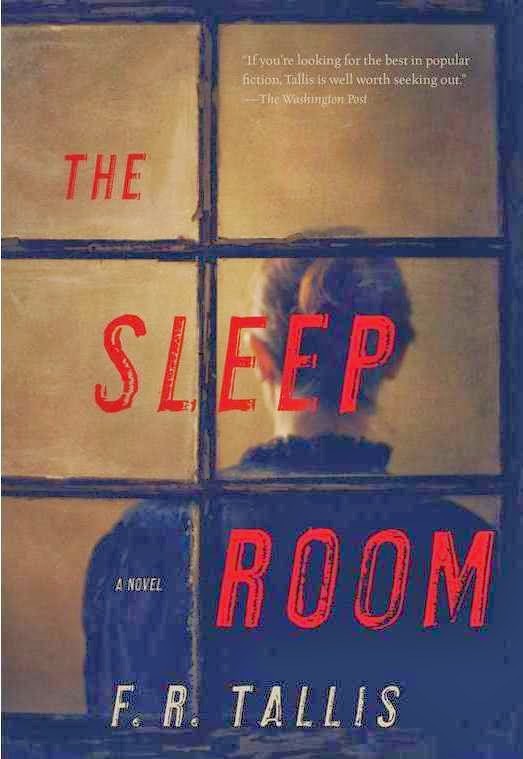 I really would like to be more enthusiastic as it's rare that I'm indifferent to a book and there were plenty of things about The Sleep Room that I thought were well-executed and enjoyable. But there just wasn't anything about it that really stood out. 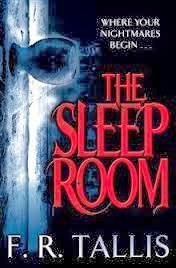 Oddly, I can see it working well as a film or a TV drama, however, and I would happily watch an adaptation of it - perhaps some arresting visual interpretations of the supernatural goings-on could lend The Sleep Room the sense of atmosphere I felt it lacked. And despite my misgivings I would almost certainly pick up another book by FR Tallis and give it a go. NB: I've included pictures of both the UK (top) and the US (bottom) covers of this book. The only reason I've done so is because I find the difference between the quite interesting - the UK cover seems to suggest an out-and-out horror novel, whereas the US one is much more subtle and much less suggestive of genre fiction. As well as being less naff, the US cover is probably more indicative of the type of book The Sleep Room is.